Advanced rapid authoring tools have made it possible for anyone to create top notch animated e-learning videos. The secret behind this is finding right software that offers a wide range of features. It is more important to find the right software which is cost effective and useful that can give you the best ROI. In this blog, we have provided you with some features that you should add to your list. One of the most remarkable benefits of using animated e-learning video maker is that it increases the video production speed. But, this entirely depends on the built-in online template library. The top tools normally include themes, layouts and rich assets. Remember that you will have to use the tools for future projects also. Thus, you require a software with unique needs, preference and learning objectives for those online learners. It must be easy for your online learners to access the e-learning course from anywhere, at any time. You have to make sure that the e-learning video is always available for quick learning. Some video maker tools may include additional fees in their package, while the others may charge additional fees for the same. So, before you click the download option, ask whether it is included in the price or not. Animated videos with high quality audio elements are very effective. Crystal clear communication and music engages the learner. So, you should prefer e-learning video maker as important as audio and visuals. This can include audio recording, editing and synchronization capabilities. Some video maker also includes built-in music and sound effect libraries to save your resources and time. There are two ways of creating characters. You can either develop your own character or you can rely on the video maker online asset library. Some top notch video makers give you the option to select which is the correct path for your e-learning video. It can include an image library, cut-out characters or interactive characters, etc. to make interactive video experience excellent. It is always good to be ready for the unexpected things. You may not find any issue now. But, there are chances that you may find a problem while using a new e-learning video maker. So, does a vendor provide you the support you require to get the most from the video maker tool or does their responsibilities end after purchasing their product? In some cases, the vendor might charge additional monthly fees or yearly fees for phone or email support and in some cases the vendor might include support in the package itself. Do you want to include some appealing images or charts in your learning video? Does the e-learning video maker offers you the rich asset value that can be used for enhancing the interactivity? 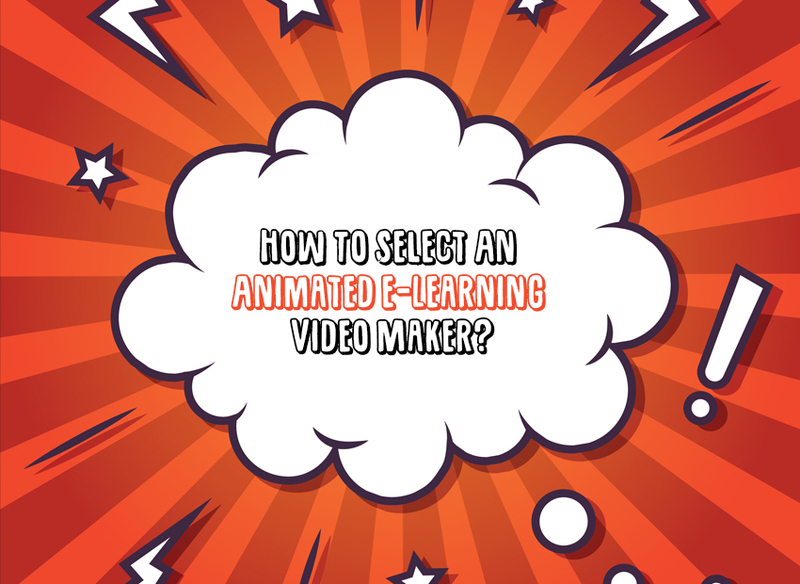 All these questions are important and should be considered while choosing an animated e-learning video maker. Some tools also give you the option to create an animated Info-graphics to make improvement in knowledge retention and make your course memorable. Will your audience really watch your amazing video created by you? The e-learning video maker should have your e-learning video in various different formats. For e.g., you can share it on video-sharing platform so that it reaches a wider audience. You also have to think about your mobile learners. For e.g. A smart phone and tablet user cannot access Flash files. It’s true that the tool might have all the functions and features that you need, but does it fit into your budget? Many authoring tools have flexible pricing plans that suit your needs. For instance, the tool may have a different add-on option, support options etc. You can give a try for some animated e-learning video maker. Many vendors offer demo for the video maker that helps you to try out their features. You can ask your team to take a free trial and get their feedback. We hope that our blog will help you in selecting the best animated e-learning video maker.